Hard to believe it’s been over six years since Bibulo.us hosted Mixology Monday XXXI, but it’s wonderful to be back. This month’s topic is near and dear to our hearts as it is our favorite type of lower-proof cocktails: shims! These drinks contain no more than half an ounce of strong spirits (i.e. those containing 40% ABV or above). Heavy-hitters are fun to drink, sure, but it’s way too easy to over-consume and under-enjoy when you’re playing hardball. Let’s stretch out our evenings and get to sample a bigger variety by lowering the proof without lowering our standards. Shims don’t require giving up on flavor, complexity, or—interestingly enough—even your favorite ingredients. Get a new understanding of your favorite high-proof spirit by using just a half or quarter ounce of it along with a milder leading player. Or take a low-proof character actor that usually supplements the main show and see if it can take the lead. This is a chance to get back in touch with the full spectrum of drink strength which defined mixed drinks in their first century or so. There’s a reason the Sherry Cobbler was insanely popular, dear friends. Or you can take this opportunity to invent new drinks in the latest style. Low-alcohol cocktails, particularly in restaurants, are still beginning their popularity climb this century. By their nature, lower alcohol drinks, especially those using wine-based main ingredients, are great choices for food pairings. If you’ve got the perfect accompaniment for your chosen cocktail, please share that with us too! One last tip, while we’re on the topic of eating: when it comes to drinking at those big holiday gatherings through the rest of the year, keep this month’s MxMo results bookmarked as your secret to harmonious parties. We can’t guarantee that no one will knock heads in political arguments or revive old feuds, but we can say that just a little less booze could make for a lot less drama. 1) Make a shim, that is a cocktail which contains no more than half an ounce of strong spirits (i.e. those containing 40% ABV or above). 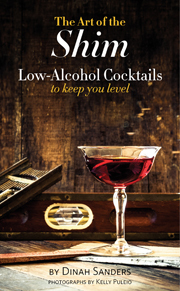 and a little bit about your approach to low-proof drinking. 3) Send us your link by commenting on this post or tweeting to us at @bibulous.